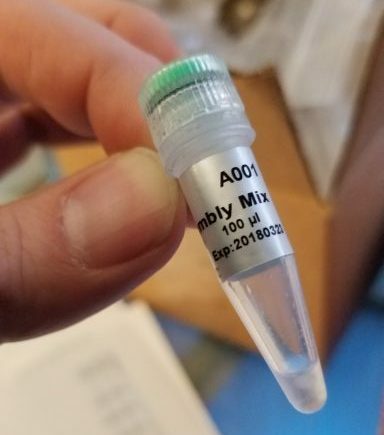 The pEASY-Uni Seamless Cloning and Assembly Kit takes advantage of a proprietary assembly DNA assembly mix to achieve directional cloning of PCR fragments that share 15-25 bp overlapping sequences into any linearized vector. 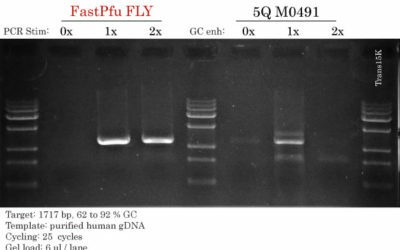 Similarly to Gibson Assembly ® and other DNA assembly enzyme mixes, this kit is highly efficient for seamless assembly of up to 5 DNA fragments. Includes Trans1-T1 Phage Chemically Competent Cell. We use this product to assemble 2 to 5 DNA fragments on a daily basis. Our overall success rate over 2 years (more than 200 different DNA assemblies) is about 98% and for most plasmids, over 90% of colonies will be correct. But in some circumstances, it may drop to 5-10% only. In our hands, such low success rate was caused by the actual genes/DNA sequences we were cloning. Difficult genes include genes coding for helicases, recombinases, polymerases and other genes related to the replication or transcription of genomic DNA in humans. We compared side by side this kit vs the Gibson cloning kit and NEBuilder HiFi DNA Assembly kit. There were no differences in the number of colonies and the % of positive clones. When your vector is well digested and the overlaps well balanced in G+C, you will get close to 100% of positive clones. 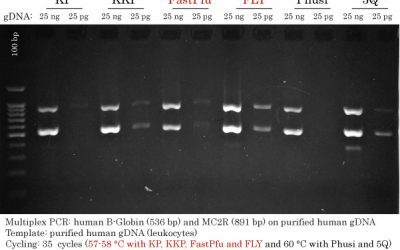 For our tests, we used an assembly of 3 fragments (1 vector and 2 overlapping PCR fragments) and we obtained 90% of positive clones. If you already using other seamless assembly kits, I suggest that you try this one. It is less expensive and you also get a cashback on your orders. CASHBACK x 2 on your next order!